Each 'term' is spilt into 5 cases launched a 2 weekly intervals. So here goes with the next case of this term! Back to the GP consulting room again today….. This 44yrs man comes to see you, his GP, on Monday morning. He explains that he was taken to A&E after a sudden collapse and hit his head at a party on Saturday evening. By the time the paramedics arrived he had already regained conciousness but was taken to A&E as a precaution. At A&E he recalls that he had bloods taken, an ECG and a CT head scan. He was advised that all investigations were normal and that his head transient loss of conciousness was thought to be 'alcohol induced'. At the time, he protested that he hadn't had excessive alcohol intake that evening (in fact, very little) and so the suggestion was made that perhaps his drink had been spiked, or that he'd reacted badly to combining alcohol with his antidepressant medication. He remains unreassured, and tells you that this was a small 'family gathering', to celebtate his grandparents diamond wedding anniversary. He feels it extremely unlikely that his drink was spiked, and he has drunk alcohol on previous occasions with his medication without any adverse effects. Since that evening, he has felt fine, but remains very worried about the cause of his collapse. You examine him and find his BP is 106/64, his heart sounds are normal. Pulse is strong and regular. His lung fields are clear. He has no personal past history of palpitations, or chest pain; and no family history of cardiac problems. His only medication is low dose of citalopram, which he has taken since his marriage breakdown a year ago. You check on the hospital ICE/pathlinks and note the normal CT scan along with the normal FBC, glucose, thyroid, LFTs and U&Es but agree to perform another ECG in view of his ongoing concern. Q1. What possible diagnoses are you thinking about whilst you await his ECG? Let's analyse the ECG methodically to get the answer…. Q2. What is the rate and rhythm? Q3. Is the axis normal? Q4. Is the PR interval normal? Q5. Is the conduction through the QRS rapid and normal, or delayed? Q6. What about the QT interval? Q2. The ECG shows sinus rhythm. settings, I calculate the rate in this ECG to be about 54 bpm. (i.e. 5.5 large squares between complexes: 300 divided by 5.5 = 54). around 13 small squares (0.52 s). Q7 Does the QT interval on this ECG need correcting using Bazetts formula? mean the corrected QT interval is very slightly shorter than it appears. This ECG shows long QT syndrome which is known to cause life-threatening ventricular arrhythmias such as Torsades de Pointes (Polymorphic VT) and Ventricular Fibrillation. 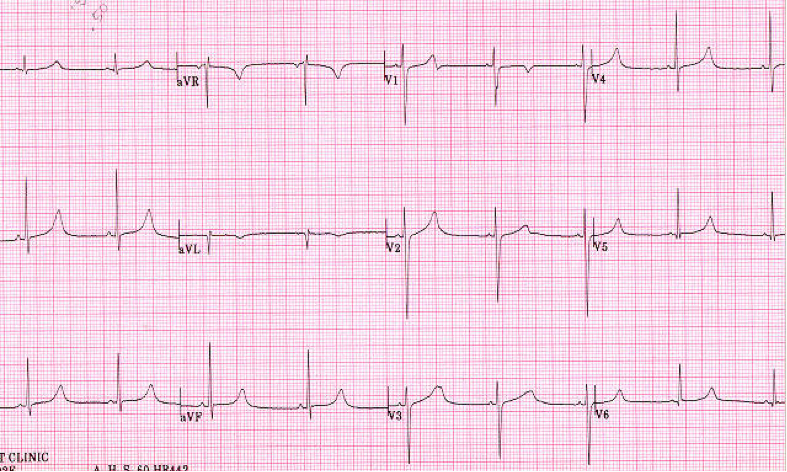 These arrhythmias might present as dizzy spells, syncope, blackouts, or sudden death. Long QT syndrome is caused by mutations in genes which encode ion channels (K and Na). This leads to a repolarization abnormality which predisposes to the arrhythmias. In some individuals the QT prolongation only occurs after the administration of certain medications. Citalopram, a frequently prescribe antidepressant is just one of these medications. Combinations of two or more such medications increases the risk further. More about drug induced QT prolongation and a list of potential drugs here. Safe prescribing advice, specific to Citalopram, is detailed here by the MHRA in their 2011 update. Usually the QT interval needs to be ‘corrected’ for heart rate, using Bazetts formula. Most ECG machines will have calculated this for you. As long as heart rate is within the normal range for sinus rhythm, then the actual QT interval will approximate the corrected QTc Interval. (In an ECG with a rate which approximates to 60bpm, there is no need to correct QT interval). QTc (ms) = QT interval (ms) divided by the square root of the RR interval (seconds). The normal QTc interval should be 0.36 – 0.44 seconds (9-11 small squares). A QTc of > 0.47 s (in men) and > 0.48s ( in women) is highly likely to be significant. A QTc of 0.41 to 0.46s is indeterminate, and long QT more difficult to exclude. A QTc Interval of > 0.46s is the frequently used cut-off. This patient, with a history of blackout, will need to have an implantable cardioverter defibrillator (ICD) fitted. This device will deliver a ‘shock’ if the patient have episode of ventricular fibrillation, therefore helping to prevent sudden cardiac death. As this condition can be inherited it would be advisable for the patient’s family members, such as any children he may have, to be examined and tested for this condition, and an ICD to be considered if positive for long QT. For the purposes of this #ECGclass, discussion around the QT interval has been kept simple. In fact, the measurement and assessment of the QT interval is far from straight forward, and like many things in medicine is frought with pitfalls. If you're interested to take this lesson to another level. Read more about it in this article by Jo Yaldren (@jyaldren) and Dave Richley. Thank you for taking part in tonight's #ECGclass. and...If you want to ask the patient any questions, or request any further investigations this can be done by the hashtag during the course of this evening.